Mike Hill is a Board Certified Safety Professional with over 13 years of construction safety experience. He is the Manager of Corporate Safety for Performance Contracting Group (www.pcg.com) and current Vice Chair of NIA's Health and Safety Committee. His experiences in engineering, project management, and estimating have provided an operational outlook in the safety arena. He can be reached at Mike.Hill@pcg.com. 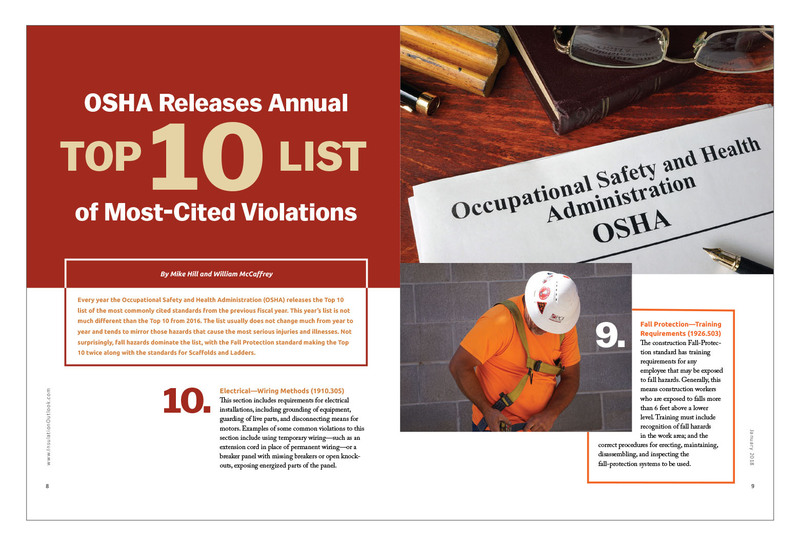 Every year the Occupational Safety and Health Administration (OSHA) releases the Top 10 list of the most commonly cited standards from the previous fiscal year. This year’s list is not much different than the Top 10 from 2016. The list usually does not change much from year to year and tends to mirror those hazards that cause the most serious injuries and illnesses. Not surprisingly, fall hazards dominate the list, with the Fall Protection standard making the Top 10 twice along with the standards for Scaffolds and Ladders. 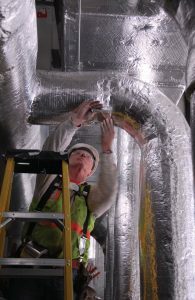 This section includes requirements for electrical installations, including grounding of equipment, guarding of live parts, and disconnecting means for motors. Examples of some common violations to this section include using temporary wiring—such as an extension cord in place of permanent wiring—or a breaker panel with missing breakers or open knockouts, exposing energized parts of the panel. The construction Fall-Protection standard has training requirements for any employee that may be exposed to fall hazards. Generally, this means construction workers who are exposed to falls more than 6 feet above a lower level. Training must include recognition of fall hazards in the work area; and the correct procedures for erecting, maintaining, disassembling, and inspecting the fall-protection systems to be used. 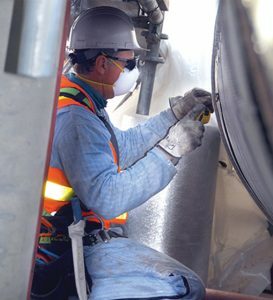 This rule requires employers to guard machine parts or operations that can cause crushing injuries, lacerations, amputations, burns, or eye injuries. Hazards created by the point of operation, pinch points, and rotating parts are examples that may need to be guarded. Guards can be physical barriers, gates, interlocks, or presence-sensing devices such as light curtains. Not providing guards, or removing or bypassing machine guards, would result in violations of this standard. The construction standard for ladders applies to portable and fixed ladders and has specific requirements for the safe use of ladders, inspection of ladders, and set-up requirements. One of the most common ladder violations occurs when an extension ladder used to gain access to an upper level does not extend 3 feet beyond the upper landing. Other violations include using ladders for purposes other than what they were designed for, such as working from a closed step ladder leaned up against a wall; standing on the top or top step of step ladders; using damaged or defective ladders; or carrying items that could cause an employee to lose balance and fall. Commonly known as Lockout/Tagout (LO/TO), this rule is designed to protect workers performing maintenance or repair on equipment and machinery that may accidentally start up or otherwise release stored energy. 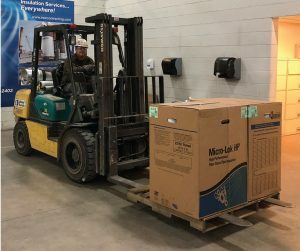 The standard requires employers to develop shut down and lockout procedures for every potential source of energy on a piece of equipment, potentially including electric power, hydraulic pressure, steam, gas, and even gravity. Valves, switches, and other energy-isolating devices must then be physically locked out with a Danger tag affixed to the lock. Removing somebody else’s lock without permission breaks one of the cardinal rules of workplace safety and should never happen. Other violations typically include failure to follow LO/TO procedures, inadequate LO/TO procedures, or lack of training. The Respiratory Protection standard is usually near the top of the Top 10 list. Employees required to wear respirators, or even filtering face pieces (dust masks), must be trained, fit tested, and medically evaluated by a physician or other licensed health-care professional annually. Employers must have a written Respiratory Protection Program and a program administrator. Other violations of the standard include employees with facial hair using respiratory protection; using the wrong type of filter; and failure to properly clean, maintain, and store respirators. Even when respirators are used on a voluntary basis, employers still have an obligation to train employees and make sure they are medically qualified. The Scaffold standard has rules to prevent falls, falling objects, and collapse. The rule requires a competent person to oversee all scaffold erection, dismantling, or modifications. A competent person also must inspect scaffolds every day and after any occurrence that could affect the safety of the scaffold. 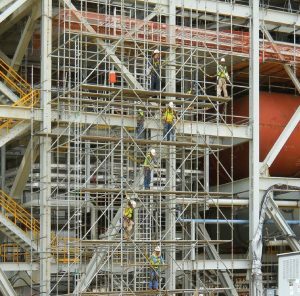 Common scaffold violations include a lack of fall protection, platforms not fully decked, safe access not provided to every level, and training. The rule has training requirements for scaffold users and for crews that build and dismantle scaffolds. 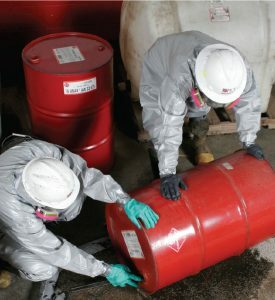 containers), and not properly training employees on the physical and health hazards of the chemicals in their work area. Duty to Have Fall Protection remains the number 1 most commonly cited standard for 7 years in a row. 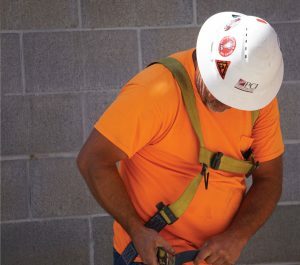 This section of the Fall Protection standard spells out where fall protection is required on construction sites, such as unprotected edges, leading edges, window openings, and roofs. 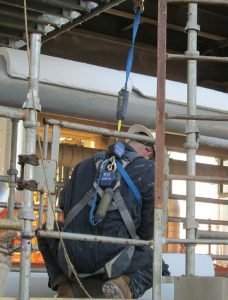 It also specifies which types of fall protection systems may be used in different situations. For example, a warning-line system is an acceptable fall protection system on a flat roof, but would not be adequate around a stairwell opening. Violations of this section could include unguarded floor openings (over 2 inches wide), openings around a hoist area, unguarded elevator shafts, or many other potential fall hazards on a construction site. The violations that make this Top 10 list every year are also the hazards that cause the majority of serious and fatal incidents in workplaces every year. If you are looking to make improvements to your Environmental Health and Safety (EHS) program, these hazards are a good place to start. It may prevent an OSHA violation, but more importantly, it may prevent a serious incident at your workplace. This article was published in the January 2018 issue of Insulation Outlook magazine. Copyright © 2018 National Insulation Association. All rights reserved. The contents of this website and Insulation Outlook magazine may not be reproduced in any means, in whole or in part, without the prior written permission of the publisher and NIA. Any unauthorized duplication is strictly prohibited and would violate NIA’s copyright and may violate other copyright agreements that NIA has with authors and partners. Contact publisher@insulation.org to reprint or reproduce this content. Managing Safety Performance: Compliance, Compliance, Compliance! Managing Safety Performance: One Tough Challenge!